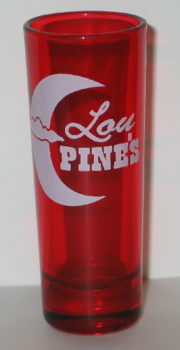 This is a new, never used clear red shooter glass, depicting the logo of Lou Pine’s werewolf bar as seen in the hit HBO TV Series True Blood. This is a 2″ wide 3-D metal cloisonne keychain that recreates the sign for Merlotte’s bar and Grill as seen in the hit HBO vampire series True Blood. This is a new, unused keychain. 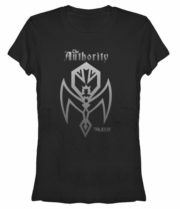 This is a 2″ wide 3-D metal cloisonne pin that recreates the sign for Merlotte’s bar and Grill as seen in the hit HBO vampire series True Blood. This is a cloth baseball style hat with a mesh back with the True Blood Merlotte’s Bar and Grill logo patch attached to the front. This is a new, never worn hat, available in either blue or black. If you do not choose we will send our choice. 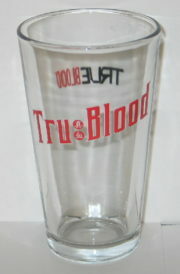 This is a new, unused clear glass 16 ounce beer pint glass with the TV series logo on the front and back, from the hit HBO TV series True Blood. 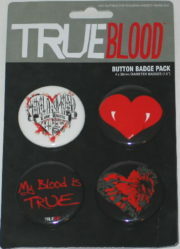 This is a mint, unused 4″ high by 3.75″ wide patch of the logo on the bottles of True Blood from the cult HBO hit TV series True Blood. This is a 25 ounce silver enamel coated stainless steel water bottle that features the name logo of Merlotte’s Bar and Grill from the hit HBO TV series True Blood. This is a 4.5″ wide embroidered patch that recreates the sign for Merlotte’s bar and Grill as seen in the hit HBO vampire series True Blood. This is a 20″ wide x 15″ high graphic printed wall mirror featuring the logo of Merlotte’s Bar and Grill as seen in the hit HBO vampire series True Blood. This is a new, unused mirror, no longer being made with a suggested retail of $49.99. 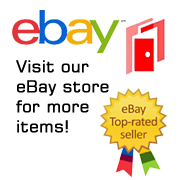 This is a mint, unused 4″ wide embroidered patch that features the logo of Sam Merlotte’s Bar and Grill as seen on his sign and the employee’s shirts from the cult HBO hit TV series True Blood. 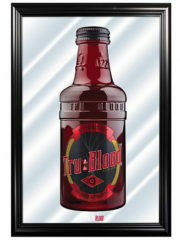 This is a 20″ wide x 15″ high graphic printed wall mirror featuring the name logo of the hit HBO vampire series True Blood. 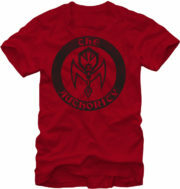 It has blood dripping down from the top left corner. This is a new, unused mirror, no longer being made with a suggested retail of $49.99.